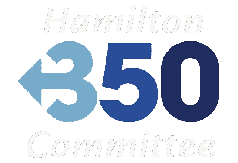 Hamilton 350 is a grassroots group based in Hamilton, Ontario, Canada, and affiliated with the continent-wide 350.org network. Our mission is to grow an engaged, aware local movement for urgent action and advocacy on the climate emergency that all of us face. This site has been dormant for about a year and a half, but we are hard at work getting it back in shape. In the meantime, to learn more about the group and about the issues, please check out our Facebook page. You can also sign up to receive emails announcing meetings, events, and actions. The next Sharing and Listening gathering is set for Wednesday February 13th, at 7 pm of the YWCA, 75 MacNab Street South. 3rd floor, wheelchair accessible. Come share your feelings and concerns about the climate crisis in a facilitated, supportive and non-confrontational setting. These circles have proven to be helpful both to climate activists and to others - a good place to invite friends or family - where expertise or detailed knowledge are not required and all views are listened to with respect. Please let Miriam <mirsager@yahoo.ca> know if you can be there. here to edit.